The constellation Ara. Roll mouse over to see labels. Ara is a southern constellation which is visible in the months around May. It lacks any particularly conspicuous stars, but has seven of fourth magnitude. The Milky Way passes through this area of the sky, and so it is home to several bright open and globular clusters. 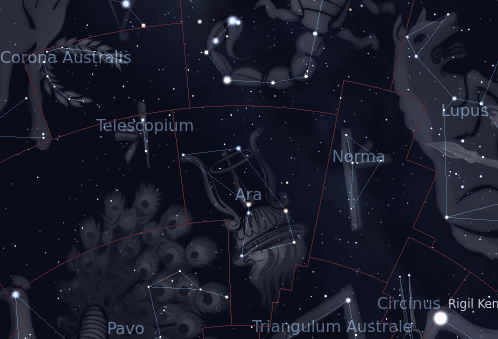 Ara is one of the southern-most constellations known to antiquity, and its name is Latin for ‘altar’. It is usually depicted with smoke rising southwards, flowing along the line of the Milky Way. In Greek mythology, Ara is identified as the altar upon which the gods swore a vow of allegiance before the Battle of the Titans. Ara contains the following Caldwell objects: C81, C82, C86. 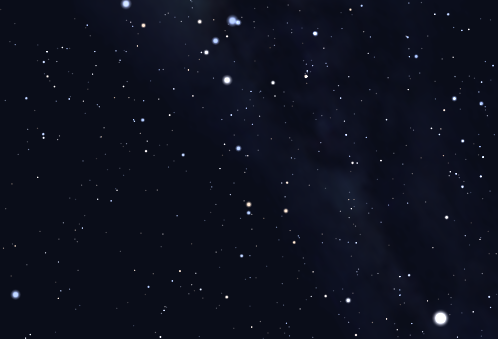 The following constellations neighbor Ara: Apus, Corona Australis, Norma, Pavo, Scorpius, Telescopium, Triangulum Australe.